Castles, pele towers and bastle houses on the borders. Castle building began with the Normans – motte and bailey affairs – or in straight forward terms a huge pile of earth topped off with a wooden crown of wall and keep. The aim was to dominate the landscape and afford themselves protection (keeping their fingers firmly crossed that no one turned up with the equivalent of an early medieval box of matches). 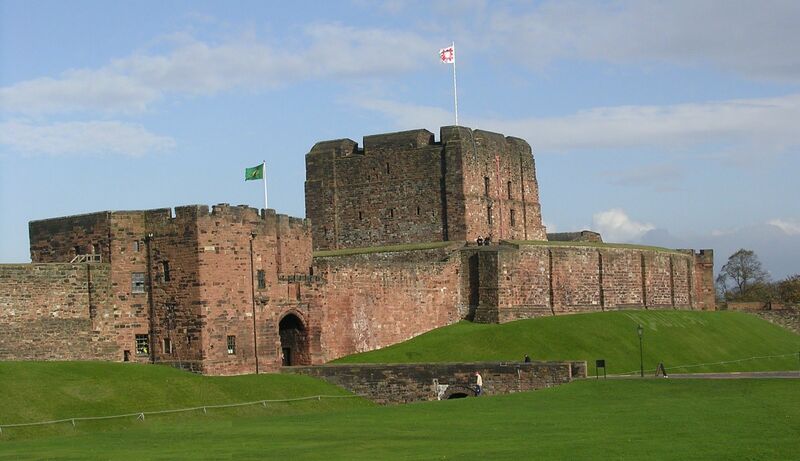 The key to Cumberland is Carlisle Castle which was begun by William Rufus during the eleventh century. It’s history reflects the political upheavals of the medieval period as well as the fact that the border between England and Scotland was sometimes apt to shift quite dramatically! In 1122 Henry I ordered that it should be strengthened with stone. By the time of his death it was still unfinished and making the most of the civil war between Stephen and Matilda, King David of Scotland moved into Carlisle and finished the building. He died in Carlisle Castle in 1135. Carlisle was regained by the English. Henry II commanded that there should be further strengthening which was just as well because William the Lion of Scotland attacked Carlisle twice with a large force in an attempt to regain the territory that his brother had lost. King John stayed in the castle on several different occasions reflecting the fact that having lost his continental possessions he was the first Plantagenet king who really turned his attention to the north and the northern English barons – it wasn’t a happy relationship leading as it did to rebellion and for a time Carlisle ending up in the hands of the Scottish again – the town made no resistance to Alexander III but the castle garrison did. It fell to the Scottish because miners sapped the south curtain wall. The Scots also bombarded it with missiles but when John died in 1216 the Scots withdrew. The fact that the roof of the castle needed repair by the mid thirteenth century demonstrates that the borders did undergo a period of peace. That all changed with the death of Alexander III. Edward I visited Carlisle many times, eventually dying at Burgh-By-Sands on his way to yet another campaign against the Scots. The next two hundred and fifty years were pretty turbulent if you happened to live on the border and this is reflected once again in the Castle’s history. July 1315 – Robert Bruce besieges Carlisle but it is ably defended by Sir Andrew Harclay who tried to establish peace but got himself hung, drawn and quartered for his efforts. It was during this period of increased militarization that Hexham Goal was built and also Thirlwall Castle which used dressed stone from a rather large nearby wall… It is situated near the Tyne-Irthing Gap a way used by Scottish raiders so its strategic position is immediately obvious. Some miles down the road, Aydon Castle turned from being a manor house into a fortified manor with its own barmkin wall. In fact, those who could fortify their dwellings did so on both sides of the borders. Peles or peel towers dot the border region and the Eden Valley. They were not built to stop raiders they were built to keep families and their livestock safe during incursions. They tend to be rectangular with a barrel-vaulted basement and two further stories above including a roof with a beacon to summon help. The Vicar at Corbridge had his own pele tower and there’s one in the grounds of Carlisle Cathedral. In other locations churches included fortified protection for local villagers in their design creating a landscape of romantic looking ruins today but which reflect the difficulties of living on the border until the two kingdoms came under the rule of one monarch. Bastle Houses are very similar to peels but built on a smaller scale – they tended to be owned by better off tenant farmers. Most of them were built in the Sixteenth Century and lie within 15 miles of the border. Anglo-Scottish history – establishing a border. 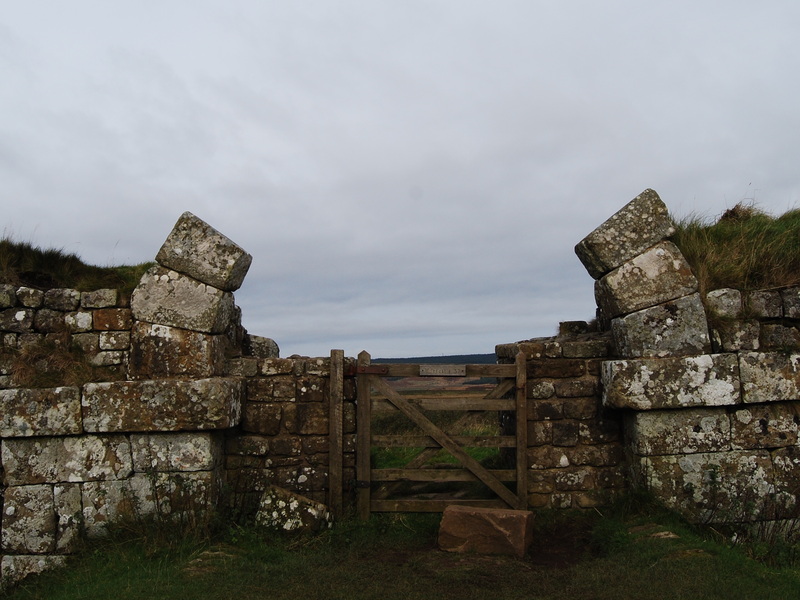 The Romans built a wall, actually two walls, there’s some question as to whether they wanted to keep the locals in and the Picts out or whether they were considering the more salient aspects of effective customs and excise. Whatever its main uses were, other than keeping Roman squaddies busy building it and then miserable guarding it, a nice solid stone (or soil and turf) structure with gates at regular intervals is quite hard to argue with. During the medieval period the border between England and Scotland shifted depending upon the strength of the English and Scottish monarchs and,of course, what else was occupying their attention. During the Anarchy or the Nineteen Long Winters as the war between Stephen and Matilda in England was known the Scots were able to extend their borders in a southerly direction. Carlisle was in King David of Scotland’s hands at this time. The reign of King John (a.k.a. Lackland or Softsword depending on how mean you’re feeling) is also a good example of Scottish kings availing themselves of convenient opportunities. In 1209 William I of Scotland and King John of England signed the Treaty of Norham which stopped the English building a fort at Tweedmouth, but at the cost of a £10,000 payment to the English: and William’s two oldest daughters, who John later married to English nobles. On the 4th December 1214 Alexander II succeeded to the Scottish throne and the following year took advantage of King John’s weakness after the signing of the Magna Carta to try to capture Northumberland. He was beaten back but a period of cross border warfare followed until John’s death in 1216. In 1237 The Anglo-Scottish border was established at The Treaty of York but like most next door neighbours with a shared fence there was still some argument about who was responsible for what. By 1244 cross border tension led to the betrothal of the three-year-old future Alexander III and four-year-old Margaret, daughter of Henry III. In October 1245 both kings sent men to agree where the border line lay from the Solway Firth in the West to the mouth of the River Tweed in the East so as to avoid any future unpleasantness. In total that’s between 97 and 120 miles, depending on what you’re reading, with lots of ups and downs. Six English knights and the six Scottish knights were sent off to ‘perambulate’ the borderline but weren’t able to agree. Twelve more knights were sent for a hike in December 1246. Again, what could have been a pleasant though rather lengthy walk turned into a rather undignified argument with the two nationalities unable to agree about which bits of land were Scottish and which were English. In the end Henry arranged for twenty-four knights to take a stroll and they all agreed. They were also all English which perhaps explains the unexpected harmony.